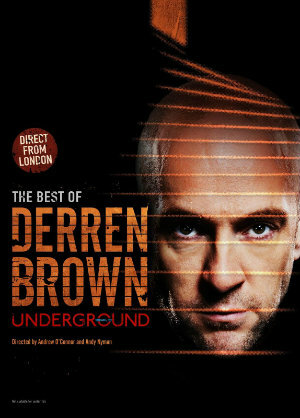 The first thing Derren Brown says during Underground is also the only thing I can tell you. He asks the crowd, politely, to not spoil the show. There are few social contracts and bonds of trust stronger than that between audience and performers,it’s one I’ve been on both sides of and do not intend to break. So, no specifics then. Instead, let’s take a walk not through the specifics of the show but through how it felt. Brown’s trademark combination of old school magic and fast talking modern charm is, if anything, even more endearing in person than it is on TV. He’s one of those performers you just instinctively like and trust. And the fact that that’s the whole point somehow only makes the entire thing even more charming. Stories are lies we tell ourselves. Great stories are lies we participate in telling to others and Underground is one of those. There’s less an audience here and more a few hundred accomplices, with Brown a mile-a-minute, supremely deadpan ring leader. That relationship, the one he builds with you, is predicated on the two specific sides of it remaining just so. So of course Brown takes tremendous delight in subverting both the expectations of the venue and the audience. He’s a constant dervish of motion except for when he isn’t, using silence and stillness just as effectively as motion and noise. And it’s when he stops for the first time (Again, no spoilers) that you begin to realize just what it is Brown is doing. This is absolutely the sort of classic illusion work with a modern twist he’s perfected over almost two decades in the business. This is absolutely the sort of profoundly honest, almost confessional mix of stand-up comedy, storytelling, compassionate connection with the world and ‘Is this your rabbit?’ surprises that he does like no one else on Earth. But it’s also something else. Something larger and more profound than any of the individual tricks. Underground is a symphony and Brown is the composer. Everything in the show moves like music does. The reveals ebb and flow with the sort of effortless grace that only years of practice can achieve. The effects constantly scale upwards not in size but in precision and depth. Brown is passionately interested in story and motif and uses both here in a way I’ve genuinely never seen any other magician or illusionist even attempt. Elements of the show resonate with you in subtly different ways long after it’s done. It’s magic you can hum, theatre you can dance to. The joy of discovery and subversion and revelation playing in perfect time with one another. Underground was an extraordinary experience and one I’ll be unpacking and looking around my memories of for weeks. Witty, smart, charming and playing with what you see and think in ways you can neither see or feel, it’s everything that attracted me to magic and everything that keeps me coming back. Thanks to everyone involved. Underground is at the Playhouse Theatre in London until October 14th. If you can, go.